Finally the last of the bounty hunters from The Empire Strikes Back is here! 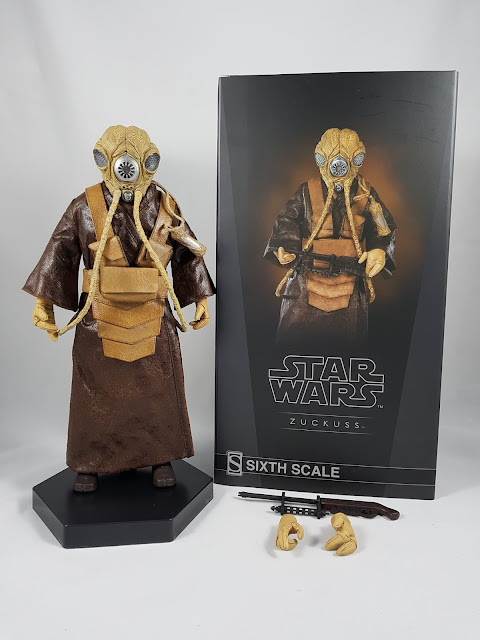 Overall, really happy to have the troupe complete, but there are some aspects of Zuckuss that scare the crap out of me. As before, packaging is the usual black and grey style that really is getting a bit boring! 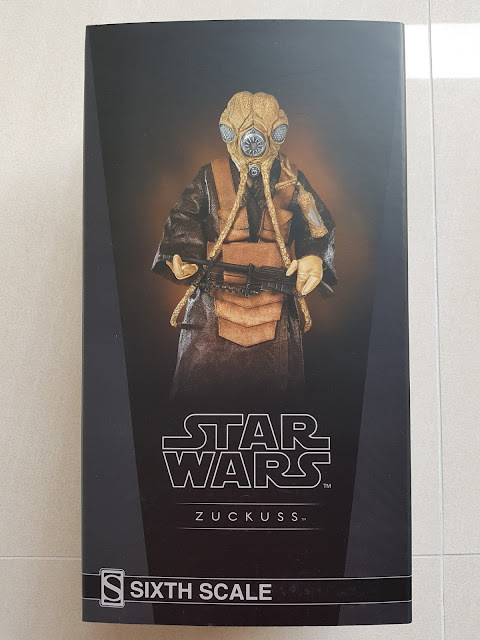 Zuckuss comes with even less than Dengar, with only another pair of hands and his rifle. Not sure if there's been much written about Zuckuss in other non-movie source material, but a few extras for the asking price would've been nice. The details and paint app on the head sculpt are great. Sideshow does aliens really well, and it shows here. The tentacles are a softer plastic and curl around to the rear. The breather bottle is a little strange in that I think it's meant to just hang there. I did look for some place to clip it, but it just hangs near his arm. Just untangle it from the rear if needed. The light tan coloured shoulder straps, pouches and layered skirt look really nice, with a detailed leather like appearance. The pouches even have their own magnetic clasp to open and close. The scariest part of the outfit is the cloak however. It's made out of a very coarse, almost sandpaper-like material. It's so rigid, it's almost guaranteed that this will crack or peel over time. 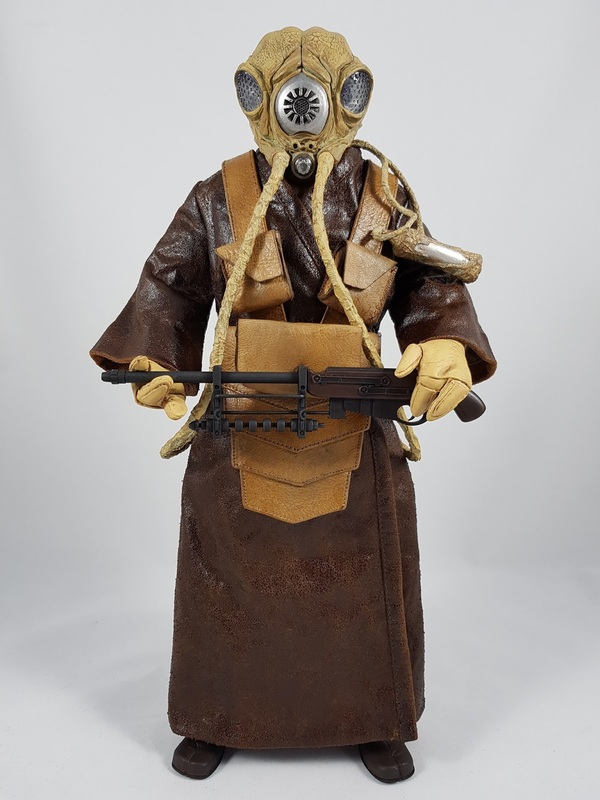 I tried minimising the bending of the arms as much as I could, whilst still allowing him to hold his rifle. The last thing you want is for the cloak to start peeling around his elbows where the creases appear when you bend his arms. On the point of bending his arms, that's pretty much all the articulation you're going to get! On mine, the arms can barely rotate forward, and the legs can barely move too. I'm not sure if it's the underlying body or the suit that is restricting movement, but it's nearly impossible to get this figure into anything other than a static pose. It's interesting that under that cloak, Sideshow still added quite a bit of detail. The boots and shin guards look decent, but will be mostly hidden by the cloak. He also has a nice pair of pants on, so it's good that Sideshow went to the effort to fully deck him out with clothes. The biggest benefit to getting this figure is of course finally completing the bounty hunter troupe from The Empire Strikes Back. They look absolutely fantastic together, especially along with the Han in Carbonite set. 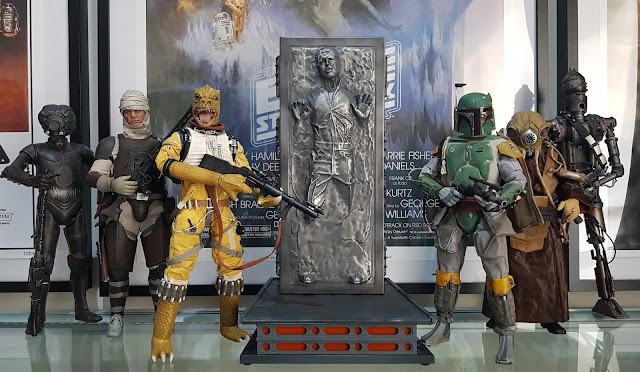 Despite the concerns around the cloak material and articulation, I think fans of these bounty hunters will have a great looking part of their Star Wars collections for many years to come!